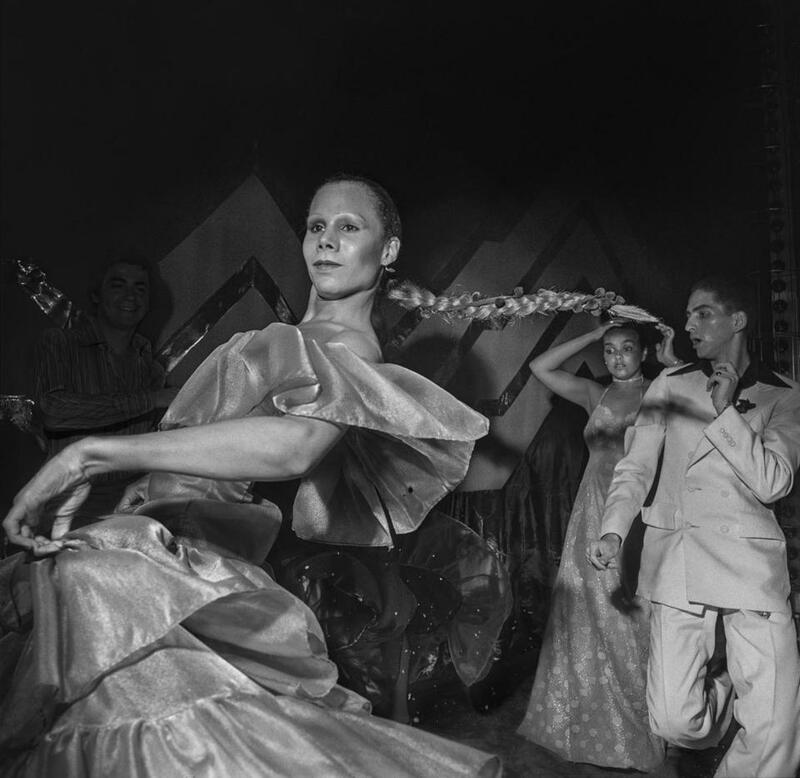 Larry Fink’s “Studio 54” is part of the deCordova exhibit. LINCOLN — It’s easy to understand half the subtitle of “Larry Fink: Primal Empathy.” The show runs through March 10 at the deCordova Sculpture Park and Museum. Fink likes to use flash when he photographs, which means many of the images are high contrast and stark, unsubtle in style (though not content). Right, primal. All the images are black and white, another kind of primal. Finally, many of his subjects — emotionally rich social situations he likes to call “fulcrum moments” — feel primal. “Viscerality is my perceptual mode,” Fink has said. The images bear that out. What about empathy, though? Fink defines it as “an animality informed by complex consciousness. It could involve any emotion.” That covers a lot of ground — including ground that’s flash-lit and fulcrum-momentous. Still, that doesn’t sound like a standard definition of empathy. Fink also says, “The pictures are taken in the spirit of finding myself in the other, or finding the other in myself.” Now that sounds more like it. Out of the collision between those two understandings of empathy — call them the variant and the standard — come the 43 photographs on display here. There’s also a bonus one, by Lisette Model (Fink’s teacher). Its presence is a nice touch by the deCordova’s Sarah Montross, who curated the show. Fink, 77, has had a long career. He took the earliest picture in the show in 1957 (an artist’s model in the studio of painter Moses Soyer). The most recent is from January of this year (a Women’s March protest). That range extends to place as well as time. Fink has been as likely to bring his camera to an American Legion hall as Studio 54, a debutante ball as a boxing gym. Flash fit right in at Studio 54, that flashiest of discos. A 1977 shot freezes a female dancer, her back curved, her long braid swinging behind her, like a Rapunzel rescue rope — or tether? The sense of stasis amid the kinetic is striking, but not as much as the dancer’s absolute lack of expression. She’s like a mannequin in motion. Fink’s camera can be in your face. Sometimes, as here, it’s in your mask. Put another way, what’s balanced on the fulcrum in those moments Fink delights in are often person and persona. A different dancer, this one with a partner, has a similarly blank expression. This is at a ball at the English Speaking Union in New York, in 1975. Something about the ’70s brought out the best in Fink. Maybe it’s because those years were such a cusp, making the decade itself a fulcrum moment. We see the woman looking over her partner’s shoulder, a chandelier above and behind them. The pallor of her face is almost as startling as that wan expression. Fink frequently fastens on faces. His camera isn’t so much assertive as insertive. If that isn’t a word, it should be. A little girl, her cheeks the size of dumplings, is having her hair done before her First Communion (a very particular kind of fulcrum moment). Malcolm X, giving a speech, is photographed from below. He takes up very little of the photo spatially. Yet Fink makes sure he dominates it visually. With “Pat Sabatine’s Eighth Birthday Party, PA,” from 1977, we get two faces — and what faces. An open screen door splits the frame. On one side is a boy (Pat?) making a face, his hand upthrust. On the other is a woman (his mother? grandmother?) bearing a birthday cake. Young and old, male and female, free and unburdened, narrow and square (the faces): The photo’s a knockout. As it happens, those two individuals are on a porch — no flash necessary there — and the picture is furious with detail. It’s a reminder that Fink is a very different photographer when shooting outside. It’s not the difference between night and day, but between night made day (thanks to the flash) and day. This is especially so in the photographs of political demonstrations. Or, even more so, of praying mantises. Yes, praying mantises. There are two pictures of them in the show, and a few more on the other side of the staircase in a separate display. In a way, they chime with Fink’s love of flash. Flash always creates surprise, both with the eruption of light and what that eruption then reveals. Seeing these beautiful, spindly figures after the dozens of dancers and protesters and family groups is to experience a very different kind of surprise.